"I remember my very first glimpse of Aikido was when I was still in elementary school, where I saw a demonstration of people practicing on television. I was immediately fascinated with how a single person was able to throw so many people in quick succession, and I thought to myself that it would be cool to learn this martial art one day. The opportunity came when I was starting my second last year of high school, a time when I decided that I should learn a martial art. I was recommended by one of my family's friends to check out Naka Ima, and so I enlisted in a trial class along with one of my friends. At that first class, I knew that I would have difficulty as I had no prior martial arts experience whatsover, and I constantly told myself that it was going to take a lot of time before I would be decent. I struggled with rolling (as with many beginners, I am sure), with my mother even saying that I looked like a ''confused deer" when doing it. I often found myself hesitant and bewildered during my first few classes, as I was unable to understand and replicate the techniques that were shown by the instructors. Nonetheless, I wanted to come back for more. It seemed that my amazement from first seeing Aikido all those years ago was still present during my training. I was more inclined to do Aikido in comparison to other martial arts at that time because I did not want to involve myself with kicking or punching, as well as not wanting to deal with competitive sparring. I was attracted to the martial art's main concept of utilizing the opponent against them and how that led to effective throws and locks. 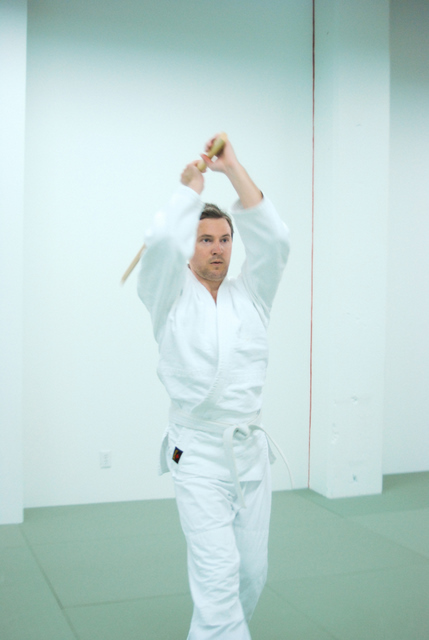 As a person with a slim body structure, I felt that I had a great opportunity to demonstrate the potential of using Aikido, since I often had to practice with adults who had a larger build than I did. Therefore, I was forced to really improve on my technique in order to properly manipulate them when they came to attack me. My physical capabilities had their own advantages during practice as well, such as agility, endurance, and especially flexibility when being pinned or locked. As I continued my practice at Naka Ima, I learned that there was a lot more to Aikido than just physical training. It served as a opportunity for mental exercise through concentration and awareness during class, figuring how to conduct one's body in order to achieve a desired outcome, such as a technique. More importantly, it forced me to look beyond my own needs and capabilities, to instead try and understand the people who were practicing with me. In an Aikido dojo, especially in Naka Ima, practitioners do not regard themselves as opponents, but rather as partners. This outlook suggests that practitioners are engaged in a mutual relationship that is built on cooperation and trust. Indeed, this is reflected in practice when practitioners execute techniques that prevent their partners from experiencing any serious physical harm. It is by that mentality that I decide to keep practicing Aikido at Naka Ima because I feel that I am surrounded by a group of various individuals who have a similar mindset in their practice, a mindset that involves improving oneself in an egoless fashion, while also helping others in that same goal to the best of their ability. I also feel that the instructors at Naka Ima, though they vary in teaching style and performance of techniques, share the same sincerity in their instruction, and try to demonstrate a high standard of Aikido. They provide instruction that is a challenge to experienced members, yet is also welcoming and approachable for newcomers. I feel that the experiences that I have gained from practicing Aikido at Naka Ima have practical applications in real life, which may not necessarily have to deal with physical confrontation. Aikido's concepts of avoiding or escalating a direct conflict, as well as maintaining the integrity of both persons in a situation, are relevant in the dialogue with other people. Aikido is an art of relations, and diplomacy (knowing how to interact and cooperative with others) is a skill that can manifest from further learning this art. As a university student who is aiming to become a future teacher, I believe that the concepts I have learned from my training will be relevant when I teach in the school, as I am provided with a way on how to engage my students through dialogue, as well as how to manage arguments. I have had a great pleasure in being a member of Naka Ima, being fortunate for the quality of instruction I have been given so far, and also fortunate for being part of a friendly and encouraging community of practitioners whom I consider as another family." "I was looking for a place to practice martial art. I didn't have a specific style in mind, I was just looking for the right spirit and teachers. I checked many places but everything felt very commercial or not right for me. I searched for a year and fell eventually on the Nakaima website and knew right-away this was the place. The more I have learned about Aikido, the more I love it. Nakaima is a place where you can grow, where you are challenged in body and spirit. You are made to feel very welcome there as a beginner and as you progress, Sensei Greg and Sensei Jesse have been wonderful at pulling the very best out of me! It is truly a privilege to practice at Nakaima. I am very thankful and glad to have joined this great community!." "The most important element to any place of learning or personal advancement is the spirit and attitude of the people in this place. The students and teachers of Naka Ima cultivate an atmosphere of belonging and support, a key foundation for some of the challenging physical and spiritual endevours offered by the school. I do recommend Naka Ima dojo as a long term base for your mind/body development." "The practice of Aikido is an excellent way to transcend the daily routine and to cleanse our spirit. Its practice leads to a more centered state and calmness. It is also versatile in that it can be nice and gentle, or devastatingly effective. I have been with Naka Ima since its foundation because of Greg Sensei. He is the most proficient aikidoist I have ever met, yet he communicates compassion and respect in his teachings. We also have a talented pool of young dedicated students, well versed in the art of receiving, and that makes my learning much easier."